You are here: Home / Beverages/ Drinks / Chill Out In July! 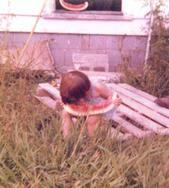 I have always loved watermelon and I have the pictures to prove it. I can remember eating until my tummy hurt on many occasions. 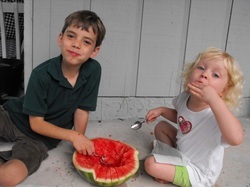 As a matter of fact, my gusto for watermelon was so great that my grandpa always promised me the first melon from the crop. Just as soon as the weather turned warm I’d start asking, “Are the watermelons ready yet?” After what seemed an eternity, weeks would pass and the crop would ripen. Then, with grand ceremony, he would present me with the “first” watermelon. I know now that it was actually the second—the first never made it out of his field. My desire to cook and create started young and even my favorite fruit was part of the experiment. I tried cutting it in different shapes, scooping it, squeezing it, and mixing it. I had so much fun trying different glasses, with or without a straw; however, I could stir things up a little differently. One of my favorite concoctions became watermelon juice mixed with lemon-lime soda in a fancy glass. As I got older, I discovered that I wasn’t alone in my enjoyment of a similar drink. In Mexico it is very popular as a version of what they call Aguas Frescas. When I started working at Walt Disney World, one of my favorite treats at the World Showcase Pavilion in Epcot was a very similar watermelon drink at their Chinese Restaurant ‘Nine Dragons’. Now I make it at home using my favorite blender and a fresh squeezed lime. It is very quick and easy to make but cannot be beat for refreshment. It is a favorite for my children now too. There's no better way to chill out this summer! 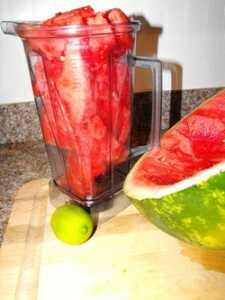 Combine watermelon, lime juice, and salt in a blender and blend until smooth. If your blender is less powerful, only blend two cups of melon at a time. Add ice and blend until smooth. Taste and adjust by adding a little sweetener (sugar, honey, or Stevia) if needed, and more ice if desired. Serve immediately with a straw, and garnish with a wedge of melon.